Choosing the right distillation method is a highly important decision. However, if you’re not familiar with the two (2) types of distillation processes, making this choice can be difficult without good information. Typically, there are two types of distillation processes that you could choose: batch or continuous. Because both of these methods have their inherent strengths and weaknesses, it it’s important that you learn more about each process so that you pick the right one. In general, batch distillation is used for small volume processing of specialty chemicals, pharmaceutical intermediates and solvent recycling & recovery. Batch distillation is ideal for situations where the feed composition changes on a routine basis. For example, solvent recovery systems where the feed composition will change with each batch. Continuous distillation is more commonly used for fractional distillation of petroleum, bulk petrochemicals, and chemicals where the composition to the column does not change dramatically from day to day. Many plants choose batch distillation out of a matter of ease. Batch distillation allows for a high level of chemical purity and maximum flexibility. However, before you choose batch distillation, it can be useful to examine its strengths and weaknesses. The biggest advantage of batch processing is that it provides a large amount of flexibility. 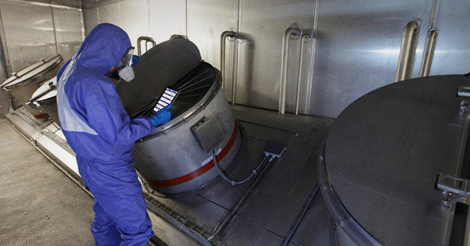 A single system will handle a wide variety of chemicals and varying compositions. A single column can separate multiple chemicals,with each going to it’s own receiver tank. Depending on the chemicals you are using, a batch can be run daily for a week and then changed out for another completely different batch quickly and efficiently. In addition, batch processes can be fully automated when combined with advanced process control using ChemCad . In most cases, two (2) or three (3) receiver tanks and one column with a still pot is needed to complete a job. If you make mistakes when switching from one distillation receiver to another, then all the impurities in a given cut can be recycled back to the still pot for the next batch. Typically, the primary control variables in operating the column will be the reflux ratio and the temperature of the still pot. However, before committing to batch distillation, you should also be aware of the disadvantages that are a part of batch processing. Although batch processing comes with a high level of flexibility, it also comes with the risk of contamination. Whenever you change from one distillation cut to another the intermediate material should go to a slops receiver for recycling back to the distillation pot on the next batch. Whenever you change out a batch, you must be aware that the new batch might be contaminated by the different chemicals used in the previous process. If this is a possibility, a cleaning process using Clean In Place (CIP) technology must be installed to ensure that there are no leftovers from the previous batch. The main two advantages of a continuous process are efficiency and quantity. With batch distillation, the batch size is dictated by the size of the still pot. Continuous processes do not have this limitation. The quantity that can be processed is limited only by the amount of upstream feed storage. A higher level of efficiency is inherent in the lack of needing to continually clean and adjust the system. A continuous distillation process will typically be more expensive than a batch system. A rule of thumb for continuous distillation is that the number of columns required is N-1 where N is the number of components to be separated. Therefore, a multicomponent feed will require multiple columns, each with its own reboiler, condenser and reflux system. Why not leverage Costello’s expert team of engineers to help you determine whether you need batch or continuous distillation. We can also help you optimize your process as well as choose the right equipment for your plant. If you like this series check out part 1, part 2 and part 3 here!